See that? Isn’t it pretty? And it’s mine, ALL MINE!!! Woo-Hoo!! 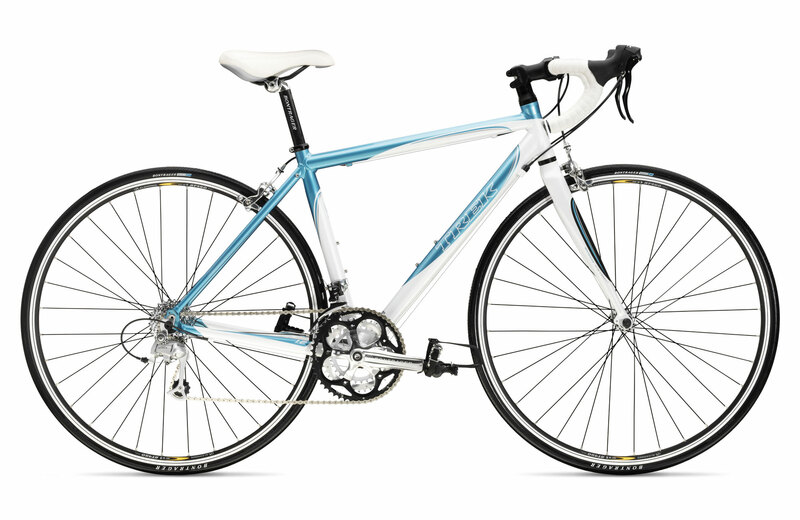 The bike is a 2008 Trek 1.2 WSD, Trek’s entry level designed-for-a-female road bike. Yep, a real road bike, with skinny smooth tires and curlicue handlebars. I’ve never had a road bike before, but I’ve wanted one for so long. I kept putting off purchasing one, because they are so expensive (yes, way more so than a mountain bike or a hybrid), but although I complained about the price, I was never closer to actually getting one. I finally realized that, in my head, I may never be able to justify the price, and if I really wanted one, I should just go get it and figure out how to pay for it later. So I did! And by the way, where is that economic stimulus payment already? I’ve already been out on it a couple times, and I will go out today to, providing the rain holds off…I’m still a little afraid of those tiny tires! It feels so light and smooth and nearly effortless, compared with my old piece of junk hybrid. And because I bought it from a bike shop (as opposed to, say, Wally-World) there were experts to help me find the right fit. I tried a couple sizes and brands, and I could really notice a difference in the geometry. I get free adjustments and tune-ups for a year, and all the components have been tweaked to fit me. I’m panning to use this bike to train for my big triathlon debut…you know…someday. And I’m planning to ride it to work. The trip is about seven miles, one way, but it has one big huge hill, that I don’t yet know if I can do. I plan to find that out this weekend, and if all goes well, I’ll be riding to work on Monday! I have two coworkers who also live in this town and are talking about riding to work throughout the summer, so that should be fun, and we’ll help keep each other motivated. I’m going to have some killer legs and a smokin’ behind (oh, yeah, I bought the shorts, too), and I won’t be buying so much gas for the station wagon. I’m so excited!! See you on the road!